You might have heard of Coco Chanel, Marc Jacobs and Donatella Versace, all of them fashion icons who marked the beginning of a new era in the world of fashion design. All of them were known for bringing an unexpected change into what was considered normal, creative or trendy at the time. What about H&M? Zara? Forever 21? These are a few of the mass fashion producers worldwide and they have definitely become the fashion representatives amongst young people today. With stores in almost every continent, these brands show us that even though we all live in different cultures, our desire to identify ourselves creatively with something leads us to unity. It is easy to think that fashion is nothing more than combining a few pieces of clothing until someone looks stylish enough, but this is definitely not the case. The Fashion industry is a nest of creativity, with its own processes and techniques, with its own audience and of course it’s particular market. In this article we hope we can unpack the different ways in which this industry works. Your wedding might be the only time when you spend hours and hours choosing a piece of clothing that sometimes even has to be made specially for you. 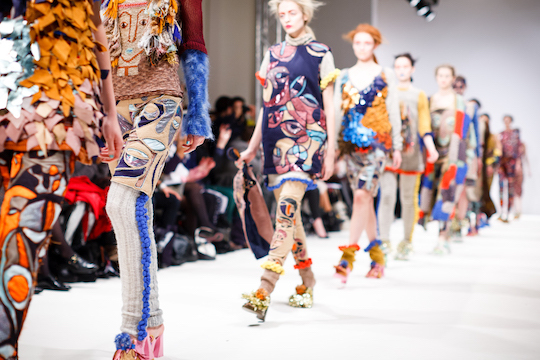 But did you know that fashion also has an industry specialised in custom made clothing? This industry and practice is known as Haute Couture, and it can also be called high fashion. This type of clothing is not focused on the market itself, it is not focused on sales but instead it’s focused on the display of creativity. These are usually unique designs that are custom made for a specific person or show. As you would imagine the price of such pieces is incredibly high, but their value lays in the fact that it is a unique idea produced with an incredible amount of detail and quality. The purpose of this type of clothing is to display the brand of the designer, to make it known and to showcase what can be done. These one-off creations are usually produced in fashion houses, in which a team of workers with outstanding skills bring a design to life and through fittings and alterations reach the client’s requirements. Designers in this range can also, and usually do, create ready to wear pieces which are produced in small numbers or can produce clothing in a massive scale for high street stores. Mass production clothing is designed with the purpose of being successful in the market and this involves the majority of the fashion industry. Unlike high fashion, mass production has a way smaller scope of creativity, allowing only for details that can be produced fast and for a small budget. We could call this trendy fashion and it is focused in what people would consume. This industry allows people to get designer clothing for a reasonable or low price, and it is meant to dress the “everyday” people. Designs in this industry have a danger of going almost straight from being displayed at the fashion week to becoming the new trend of the season. Mass production designers then could be responsible for what we call fast fashion, a production of clothing that seems almost disposable once the next season shows up. It would be important to notice that there is nothing wrong with mass production clothing, since we all love to identify ourselves with a specific brand or style, but it can certainly have ethical implications of which we will talk about in our next article. The Fashion industry can be defined as the art of creating and selling an image. Designers use their imagination to showcase the human figure and what it can look like. It all starts with the designers who bring a concept to life, and it continues with the chain of workers that prepare the product. But having a product ready to be sold is useless if there is no market to sell it to. So along with the design comes the marketing, the prices and competition. I personally love fashion and see it as a catalyst of creativity, that in the midst of so much comparison and what seems to be a fight for an outstanding image, it serves as a vehicle for humanity to express itself, to show in colours, textures and shapes what they have on the inside. Don’t get me wrong, what you wear will never determine who you are, but who you are can always be reflected in what you put on.